So last October I read William Shakespeare's Star Wars and loved the concept of combining Shakespearean style with Star Wars. 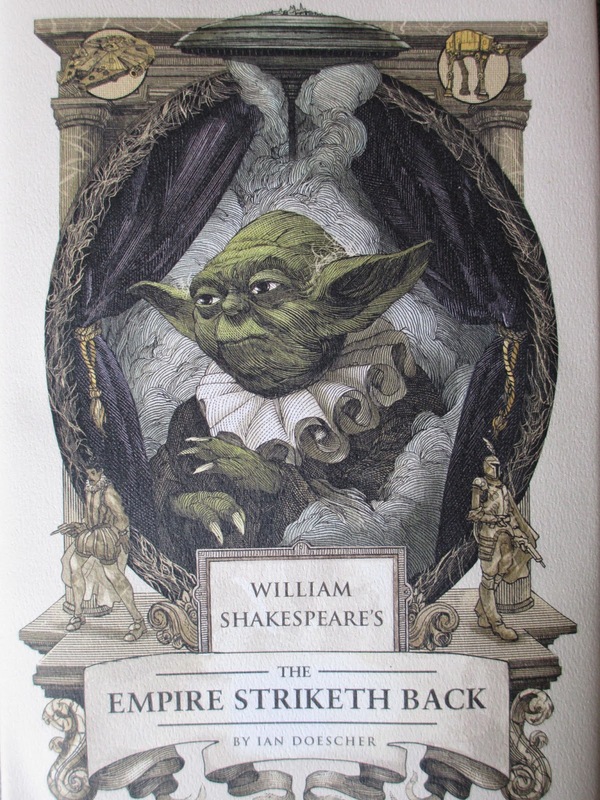 Now Ian Doescher is back with the sequel, William Shakespeare's The Empire Striketh Back. Let's just take a moment to appreciate that title and this Yoda-adorned book jacket. While I really enjoyed the first installment, this second book was, I believe, even better. Possibly much, much better. All of the seamlessness of combining the two worlds remained and was also amplified. Where in the first book I sometimes could tell that the dialogue was being taken from the movie (which, of course, it is), here it always felt so natural--as if its existence could have just as easily started in this book rather than in the movie, as if the movie's dialogue was based on the book's. Everything was so coherent. Extra flourishes, descriptions, and metaphors made the text glow that familiar sense of drama. And that's the thing, too. Once again, Ian Doescher reminds us of how like a dramatic play is the Star Wars trilogy. His combination with these books works because characters, themes, plot, even setting, all flow according to a recognizable, treasured tradition. This second volume plays all of that up, letting us see what the characters are thinking at certain moments, foreshadowing what is to come, and pondering the symbolism of certain events or conflicts. Much of it is beautiful language, really--I know there are still direct references to Shakespeare, but I found myself recognizing less of them in here than in the first book. So instead I was left, blissfully, forgetting about Shakespeare in favor of a Shakespearean-flavored Star Wars drama. I also started to realize that these books are written so that they could actually be performed as plays. How interesting that would be . . . I look forward to the third installment, and perhaps also the prequel trilogy while we're at it?